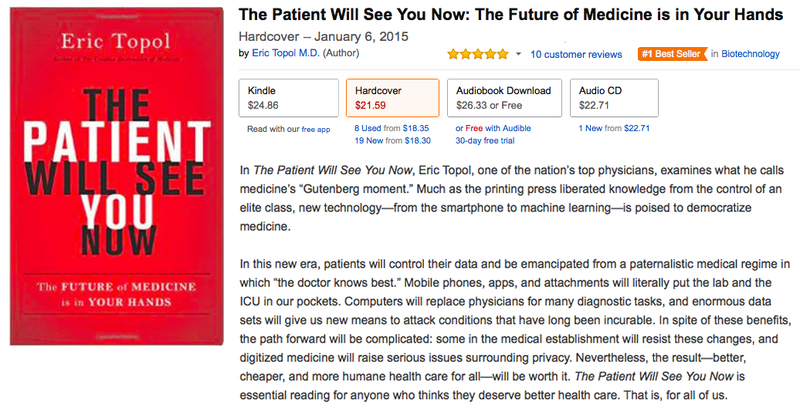 Following on from the best selling Creative Destruction of Medicine Dr Eric Topol’s latest book The Patient Will See You Now is now available on Amazon/Kindle. 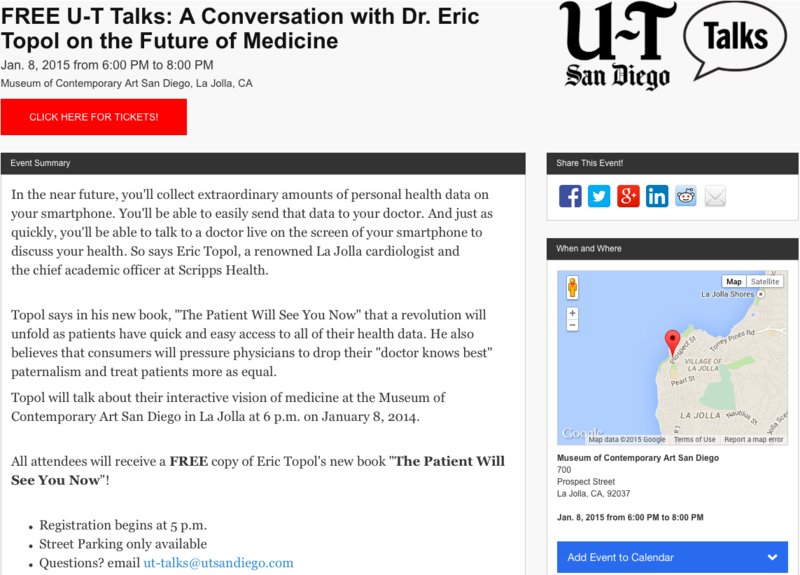 At 18:00 on 8 January 8 2014 at San Diego’s Museum of Contemporary Art in La Jolla, Eric Topol MD will give a talk on the future of medicine in which he’ll discuss the opportunity to collect personal health data, share it and Video Consult with a Doctor with just your smartphone. Joining Dr Topol for the discussion panel will U-T San Diego journalists Gary Robbins (Science & Technology) and Bradley J. Fikes (Biotechnology). To register for your free ticket click here. For any questions email ut-talks@utsandiego.com. All attendees will receive a FREE copy of the new book. “Dr. 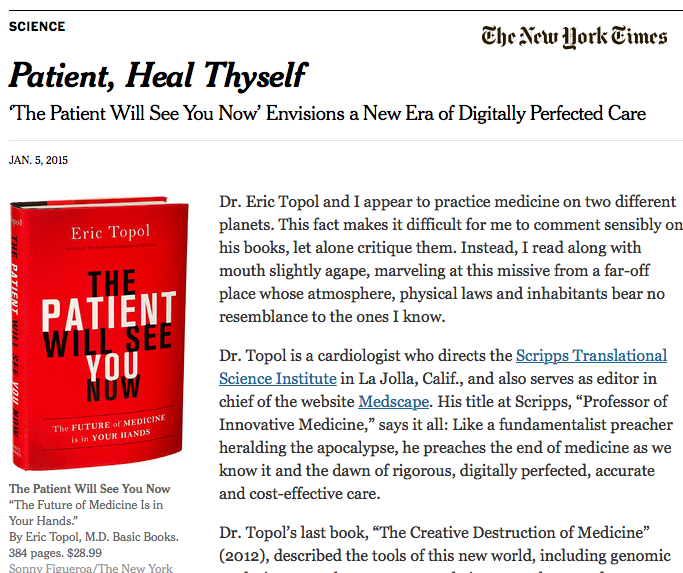 Eric Topol and I appear to practice medicine on two different planets. This fact makes it difficult for me to comment sensibly on his books, let alone critique them. Instead, I read along with mouth slightly agape, marveling at this missive from a far-off place whose atmosphere, physical laws and inhabitants bear no resemblance to the ones I know. I understand some of the criticism as I also have concerns about a mythical future where Digital Health is the Answer to Everything but this is a book about the future so we shouldn’t feel surprised if we find some of it challenging. For me the criticisms are a reminder of how challenging many Doctors find it working in a technical era that is very different from the one in which they were trained and in which they are expected to continue providing undocumented care with an unviable funding model that hasn’t evolved from the 2000 year old sickcare model with it’s focus on producing ‘visits’. “Finally comes the interesting philosophical question of whether all patients really do want — or, indeed, should want — to be their own doctors. You could actually write a book on that question, a book that might penetrate a little closer to the essence of medicine than Dr. Topol ever gets. When you work within a system that involves forever trying to guess at what Patients want (how else do you think it’s possible to manage Patient needs while interrupting them before they’ve had 18 seconds?) it can become second nature to just presume you will always know what Patients want. Within the Instant Medical History questionnaire that we utilise as part of the remote consults we offer at 3G Doctor a very revealing question that Patients can choose to answer is how much they would like to be engaged in their care. You’d be surprised how much better you can serve a Patient when you just let them tell you how much they want to be involved (I’d Never Admit That to My Doctor. But to a Computer? Sure). I think here there’s a presumption being made that decisions need to be made by someone else (eg. a person and not a compassionately programmed computer that is always on, doesn’t need sleep, etc) and that sick people and their carers somehow find it easy to manage their healthcare needs using out of date tools that don’t even make sense to the born mobile generation. > the Patient no longer needs to remember when to test (the M2M glucometer device and/or their mobile phone will automatically remind them when it’s required). > data (the dumb numbers diabetics with unconnected glucometers need to interpret and collect) is automatically turned into actionable information. > decisions can be made whenever/wherever by the specific individual protocols that carers can set. > advice can be found and questions can be asked (my simply opening the Diabetes Pal app on a mobile). > ‘tracking’ becomes redundant because the process of collecting the data just becomes seamless. “JZ: you talk in the book about this being medicines Guttenberg Moment, what do you mean by that? …(4min) so we’re an on demand I want it now culture and it’s now extending to medicine as well. JZ: so we hear President Obama talk all the time about bending the cost curve of medicine and making this affordable because American medicine is wildly expensive, and we spend a huge amount of our GDP in this country on healthcare. I can wait two weeks to go and see my General Practitioner or I can force my insurance company to spend twice as much and I can spend twice the copay to go to an urgent care centre here in New York City, or if I use an app on my phone to get a Doctor to come to my house presumably that’s even more expensive. These are all fancy ways of doing things but can we afford a world in which we’re all doing everything on demand? I think Eric has it spot on. Josh should check out the PatientCommando campaign from Patients who would like their Doctors to provide them with another 18 seconds before interrupting, or interview Roy Lilley’s 93 year old mother as he’d learn that this isn’t about finding fancy ways of doing things this is simply about using the tools of our time to think beyond the office visit and make things easier for Patients who face enough hassles without having to endure avoidable journeys and waiting room experiences. 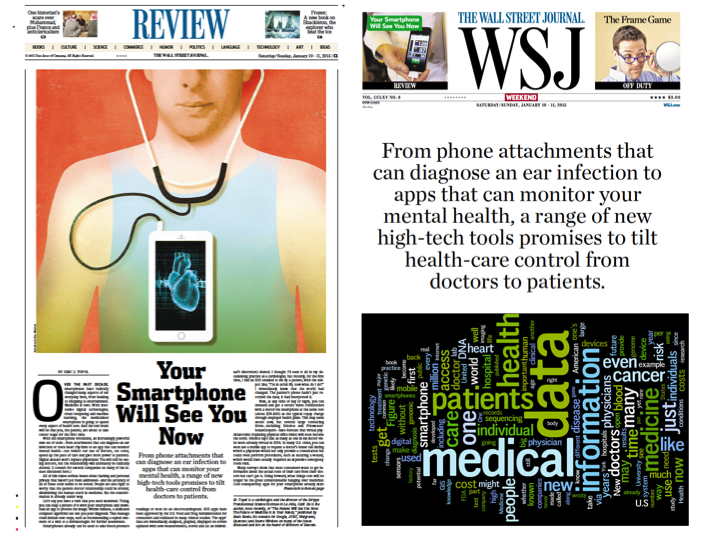 In a WSJ Saturday Essay Eric Topol has managed to boil the essence of his 100,000 word book down to 2000 words. Read it and then order your own copy. It’s not really that difficult to imagine this type of scenario developing if we let AI take decisions because there will be few (if any) people capable of winning the argument against a computer that can really on much greater resources and has time on it’s hands that clinicians don’t have. 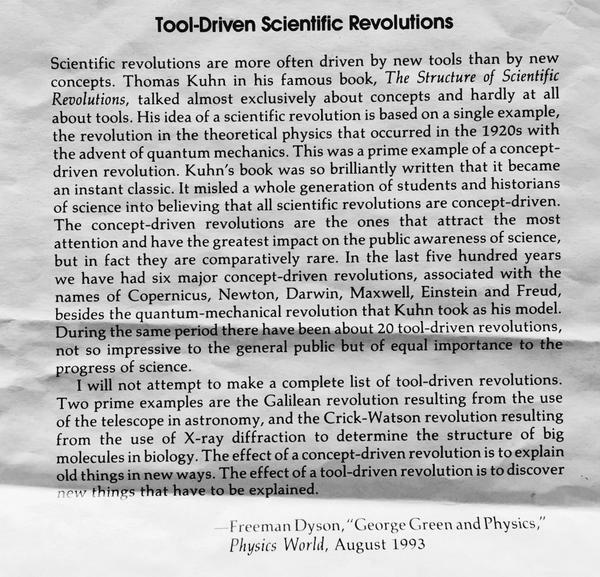 To my mind that’s exactly why a book like #TPWSYN is so important. We need to have wider debate of these issues – an area that David Woods (@DW2) is doing great work on in the UK (see the call for feedback on his Tranhumanist Political Manifesto here). Websites like this one or this one (with video content embedded in it) are great for sore throats? It stuns me how many people have this impression of hypochondriacs (eg. that it’s a mental health problem). The worst cases I’ve seen are Doctors and often it’s the result of the frustrations sensible Patients and Carers get when they’re forced to interact with a system that is designed for a different era at a time when they really need all the help they can get. We treat it and help you avoid suffering a debilitating stroke? I love SIRI (I’m ‘typing’ this with it’s Nuance Speech Dragon relative) but it’s important to appreciate it’s limitations. Dismissing it because of it’s current failures will cause us to miss the opportunity eg. imagine civilisation had ignored the printing press because in the early years the books weren’t interesting to a particular reader. There will never be a better time to start talking about these issues. The internet is radically changing the Doctor Patient relationship. Buy the book and read it and that will become clear. If you have any doubt consider this one fact: Family Doctors here in Ireland no longer see croup (because mothers use the internet to understand and treat it)? Never dismiss Patients and their Carers. They will continue to amaze and exceed all your expectations if you care enough to take the time to listen to their stories. 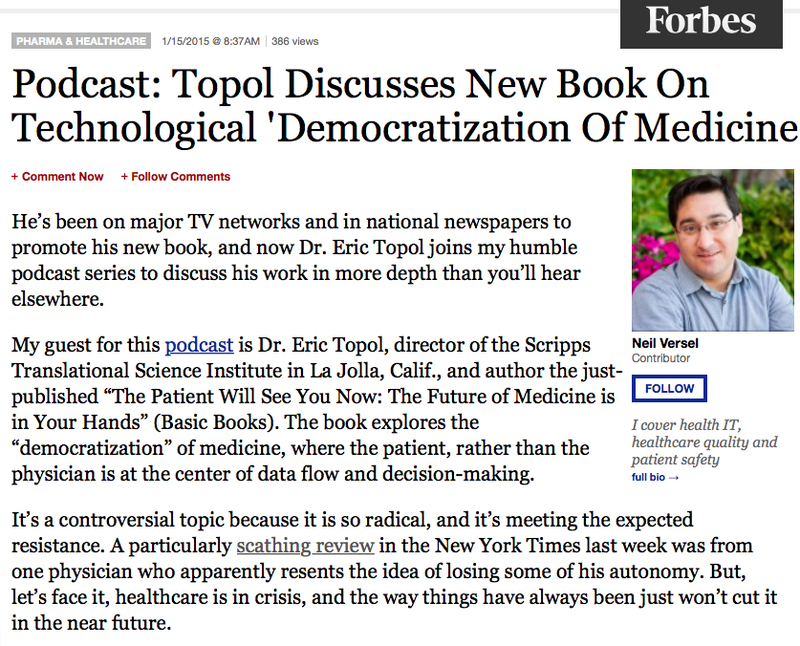 Seemingly nothing can stop Eric Topol’s blazing trail with the media (even during CES – the world’s biggest consumer electronics event – he’s been captivating the attentions of the world’s top tech news reporters) and yesterday it was NPR’s Nancy Shute who led with “Imagining A Future When The Doctor’s Office Is In Your Home“. “Extracting medical care from the health care system is all too often an expensive exercise in frustration. Dr. Eric Topol says your smartphone could make it cheaper, faster, better and safer. That’s the gist of his new book, The Patient Will See You Now… …(BUT) won’t a lot of people be left behind because they can’t afford to do this or can’t manage the systems? Read this Biotronik sponsored paper and appreciate what is acheiveable when we just turn on the connectivity in cardiac devices that Hospitals and insurers routinely ignore today (not a properly designed mHealth solution with embedded connectivity like Telcare have created for Diabetics). Understand that the 2000 year old healthcare model is broken and no longer viable. Now try and think like a member of the born mobile generation. The reality is that cardiac events like those ‘Mark Kropf’ is concerned about are probably happening today but we’re largely ignoring them and failing to understand their implications because there’s a complete lack of real time connectivity (eg. Patients who have battery powered implanted cardiac devices don’t know if it’s switched on or off or even the status of it’s battery yet they nearly all know the same about their mobile) or because everyone apart from the Patient (who typically just wants the best care) wants to avoid the medicolegal implications that come with accurately documenting healthcare, and because we’re completely failing to learn from other industries that leverage data to reduce the impact of failure and prevent problems developing (eg. the auto industries warning lights and ‘limp home’ mode that trigger long before engines are irreversibly damaged). 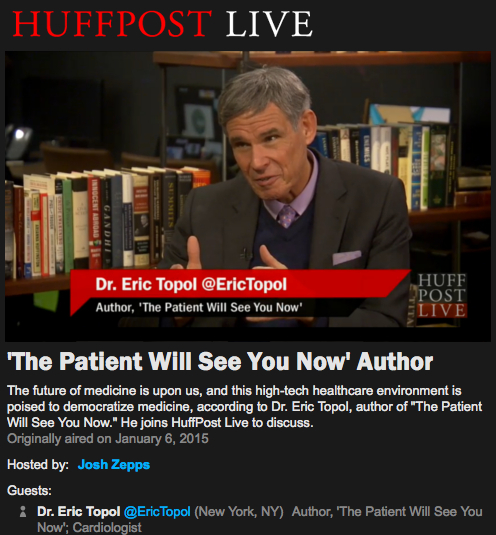 Watch this video: Eric Topol is no drug company shill. Thankfully Doctors are increasingly seeing the opportunity to break with the revolving door 5 minute unprepared and undocumented consulting model. Let’s hope more citizens have the clarity enjoyed by “SeaLady” and are supporting the forward thinking Doctors who are prepared to spend their invaluable time learning about new tech and putting it to work to extend the care they offer to their Patients beyond the four walls of their clinics. 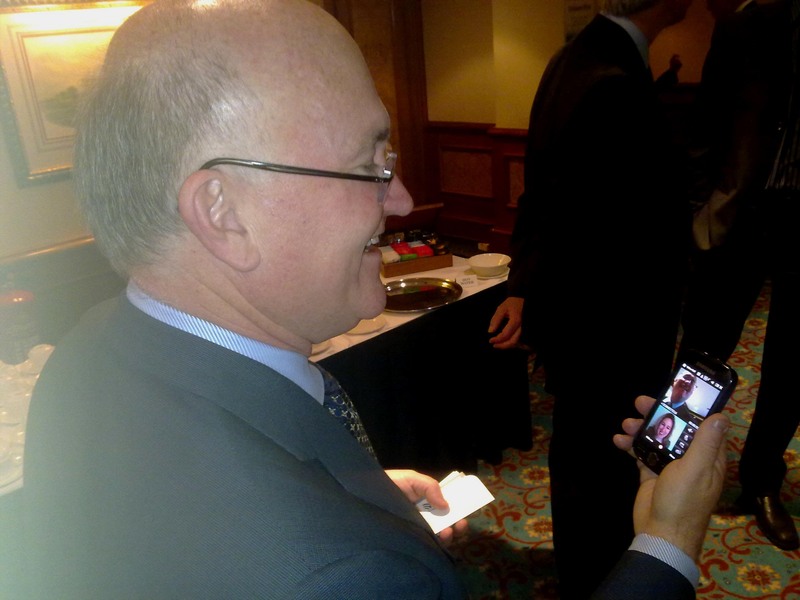 NV: When you say ‘Health Spring’ you’re likening it to the Arab Spring that was driven by social media? It’s a bit chicken and egg but it’s important to realise the Arab Spring didn’t happen because of social media but because of mobile – the newest mass media – and the ability it afforded to access social media. This might be hard to appreciate when you live in a broadband connected home with 5 TVs, a PC, Laptop and 2 smartphones but citizens in the Middle East weren’t primarily activated by social media websites but from the SMS and MMS messages that were sent to their inexpensive mobile phones (typically Nokias) by other ‘revved up’ citizens with their own inexpensive mobiles. Evidence for this can be found by looking at the distribution of technology around the world (eg. the mobile phone is the ONLY DEVICE that beeches the digital divide and has MORE OWNERS in emerging markets) and how quickly many governments in the Middle East went about taking down and blocking/monitoring internet access because clearly these activities would’ve undermined attempts by citizens to share messages (and content like videos) back and forwards with websites like Facebook.com. Instead they were sharing them P2P via mobile networks and in person (think screen sharing, Bluetooth, SD Card transfers, etc). 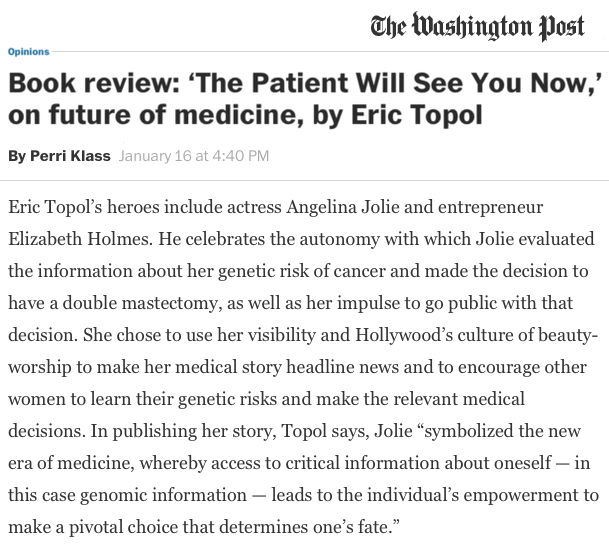 Book review in the Washington Post by Perri Klass, Professor of Journalism and Pediatrics and the Director of the Arthur L. Carter Journalism Institute at New York University. 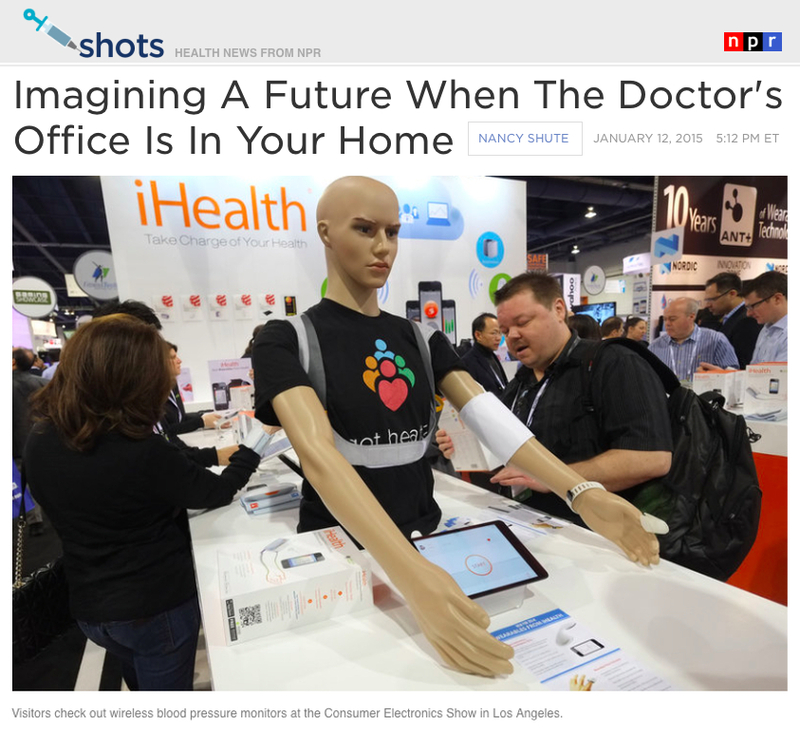 FoxNew HealthTalk’s Dr Manny talks to Dr Topol about how the future of medicine is at your fingertips.